Apple released macOS Sierra last week, and by most accounts it’s a good, stable update to macOS. We’ve heard very little about incompatibilities and Light Blue is running well on it, with one potential snag. Sierra introduces a new iCloud feature called Desktop & Documents sync. This moves the contents of your Desktop and Documents into iCloud and syncs them across all of the devices that are linked to your iCloud account. While it’s convenient for a lot of Mac users, photographers might find this a bit problematic in that if you’ve got a lot of data in these folders (big piles of RAW files all over your Desktop, anyone?) 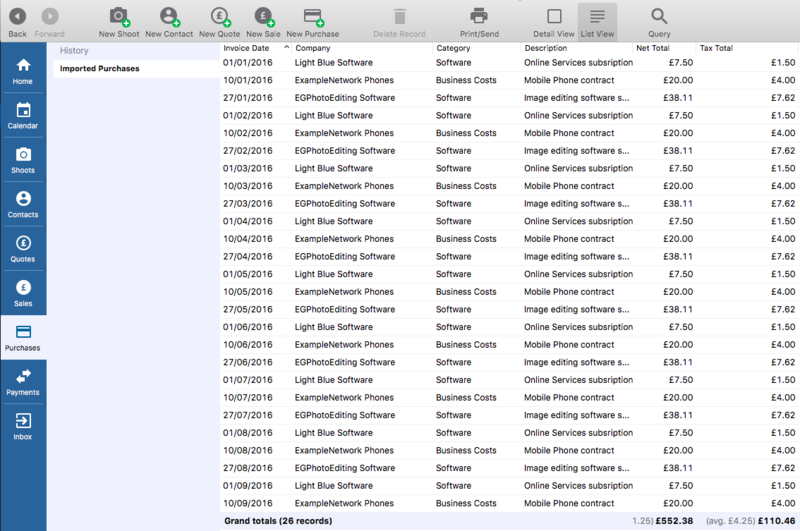 then you’ll quickly run into iCloud’s storage limits unless you upgrade to one of Apple’s more expensive iCloud plans. You can find out more about how these feature works (including some scary things that can happen while setting it up, or turning this feature off again) here. More importantly, this new synchronisation feature has the potential to interfere with Light Blue’s own data and file syncing. Therefore, we’ve released an update that moves Light Blue’s data folder to a location that won’t be affected by this feature. This new data folder location is less convenient for anyone who wants to manually create or restore backups, but avoids any potential problems caused by this new iCloud feature. You can update to Light Blue 6.1.4 b1 by using the ‘Check for Updates’ command, which can be found in the Light Blue menu on a Mac or in the Help menu on Windows. Versions of Light Blue older than Light Blue 6 store their data in a different location, and aren’t affected by this new iCloud feature. Earlier this year, we launched Light Blue 6.1 and were delighted to be able to introduce integration with ShootProof. ShootProof provides stylish online galleries that beautifully showcase your work, and intuitive sales tools that help you to sell your images to clients. They’re also leading the way with allowing developers like us to automatically gather information about customer orders. With this new integration, anyone who subscribes to our online services can have notifications of new ShootProof orders automatically sent through to the Inbox in Light Blue, from where you can seamlessly import them, without having to re-enter anything. Our friends at ShootProof got together with London photographer Julia Boggio recently to talk about how both Light Blue and ShootProof are key parts of her business, and how Light Blue streamlines all of the invoicing, bookkeeping, and management processes involved in dealing with ShootProof orders. If you’d like to find out more about Light Blue’s integration with ShootProof, Ian’s recorded a short tutorial that walks you through how to set it up and start receiving ShootProof orders in Light Blue’s Inbox. It’s all very well recording your income, but unless you also have your expenditure in the same system then you can’t see how profitable your business is. The advantage of managing your photography business in Light Blue is that everything linked together. It allows you to quickly & easily run reports on the financial state of your business, something we discussed in more detail in an earlier article. You may have previously recorded your business’ expenditure in another system, or perhaps you’re using some receipt scanning software that produces a spreadsheet of purchases. Alternatively, you may have recurring expenditure in the form of subscriptions or regular purchases. 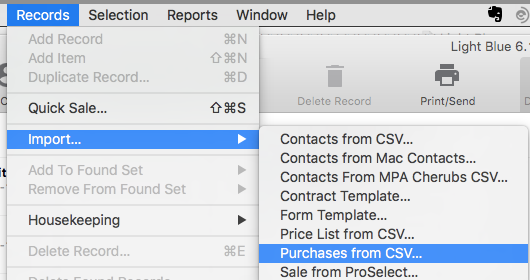 We introduced a really handy feature in Light Blue 6 which allows you to create many purchase records in one go by importing from a spreadsheet file (.csv). It’s a huge time saver when you’ve got lots of expenditure records to add at once. Here’s an example of how to format your CSV file, you’ll notice that each line of the spreadsheet represents a new purchase, with the details about that purchase recorded in separate columns. The formatting of dates and numbers is quite important. You must make sure that dates are written as dd/mm/yyyy (separated with slashes and using 4 figures for the year). You don’t need to include the currency symbol for financial amounts, just the number. Once you click import, Light Blue will create a new purchase record for each of the lines in the CSV file, as well as a payment record for the date that you indicated the purchase was paid for. All of your expenditure data is now in one place with just a few clicks. It’s ideal if you’re moving from an old system or have a record of your purchases in another format. We regularly release free updates to Light Blue that tweak existing features and fix bugs. Today, we released Light Blue 6.1.3 for Mac OS X and Windows. If you’re one of our subscribers, or if you’ve bought a standalone licence for Light Blue 6, you can download this latest update by using the ‘Check For Updates’ command from within Light Blue. If you’re using a Mac, you’ll find this command in the ‘Light Blue’ menu. If you’re using Windows, it will be in the ‘Help’ menu. Forms that have been submitted but not imported into Light Blue can now be printed via the linked shoot’s Activity panel. Fixed a problem where some mail-merge tags that contained special characters could fail to work properly in contracts. We’ve changed the “Your details” heading in our sample wedding booking forms to “Wedding couple’s details”. You can now use all of the usual date options when using the ‘Email Date’ field in the query dialog. Appointments that have been created but not linked to any other records can now be edited via the calendar. Fixed a problem that could prevent our licence agreement from being displayed on Windows. Fixed a problem that could occur when trying to link a shoot that doesn’t exist to a purchase item. Fixed a problem that could prevent you from importing an MPA Cherubs data file that contains inconsistent data. When you delete incoming data via the Inbox, any associated form is now always deleted as well. Fixed a problem where, on Windows, changing the price list in a sale or quote item dialog failed to take effect until the dialog was closed and reopened. We’ve fixed any unexpected quits that have been reported to us. Required fields are more prominent and, if they haven’t all been filled in, an explanation is included next to the disabled ‘Submit’ button. ‘Wedding Couple’ controls on forms now always require two contacts to be added. Added a drop-down menu to time controls, to make it easier for clients to enter times correctly. When a client adds new contacts to a form, they now appear in the correct order in Light Blue Inbox and in the email that’s sent to you. When using a popup contact form, clicking the ‘Submit’ button scrolls you back to the top of the page to ensure that the thank you page is visible. Popup contact forms are now reloaded if you close and reopen them. Our popular video tutorials are short videos that are focussed on helping you to get to grips with a specific feature or task. Our regular webinars offer either an introduction for newcomers to Light Blue, or a more in-depth look at specific features. For example, we’ve recently hosted webinars focussed on managing your business’ finances with Light Blue, or making use of our online contract and forms services. You can find a list of upcoming webinars, and recordings of all of our recent ones, on our support page. Helping photographers set up all of the resources and processes for easily handling enquiries and managing your shoots. Helping identify what information you find useful for running your business, including setting up helpful reports & queries. In-depth training on specific aspects of using Light Blue effectively for your business, such as how to handle specific invoicing and bookkeeping scenarios. Training for new employees, to quickly bring them up to speed on using Light Blue effectively. Prices for one-to-one training and consultancy start at just £35 (plus VAT, where applicable) for a half hour session. If you’d like to book a session, or to discuss the possibilities, please get in touch via email. In a couple of weeks, Apple are going to be releasing macOS Sierra (yes, they really have stopped called it “Mac OS X”) and iOS 10. Because many of our customers like to upgrade their Macs, iPhones, and iPads as soon as new operating systems become available, we’ve been testing the latest versions of our apps with both new operating systems. As with all major operating system updates, it is a very sensible idea to be cautious about updating all of your computers and mobile devices at the same time. Although our testing of Light Blue 6 and version 3 of our iOS app has been positive so far, there is every chance that Apple could change something that breaks compatibility or that we’ve missed something because we can’t test every conceivable combination of devices and settings. Also, please note that our testing has been has been focussed on the latest versions of our desktop and mobile app. The vast majority of our customers are already using Light Blue 6.1.2 and version 3 of our iOS app, and if you’re using older version of either the desktop or mobile app then please update to the latest version to ensure that you’re able to take advantage of all of the new features and bug fixes that we’ve been adding. You can update the desktop app by using the ‘Check for updates’ command (in the ‘Light Blue’ menu if you’re on a Mac, or in the ‘Help’ menu if you’re using it on Windows), and you can update the iOS app via the App Store.